Direct history is obtained from conscious patients. Witnesses and emergency personnel can provide valuable information regarding unconscious or seriously injured patients. Possible indicators of major renal injury include a rapid deceleration event (fall, high-speed motor vehicle accidents) and a direct blow to the flank. In assessing trauma patients after motor vehicle accidents, the history should include the vehicle's speed and whether the patient was a passenger or pedestrian. In penetrating injuries, important information includes the size of the weapon in stabbings and the type and caliber of the weapon used in gunshot wounds since high-velocity projectiles have the potential for more extensive damage. The medical history should be as detailed as possible, as preexisting organ dysfunction can negatively effect on trauma patient outcome (Sacco et al. 1993). In the early resuscitation phase, special consideration should be given to preexisting renal disease (Cachecho et al. 1994). 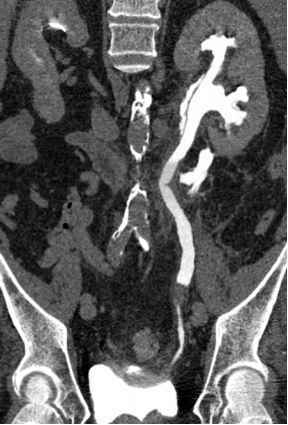 Another point of interest is the functioning renal mass of the trauma patient, as there are numerous case reports in the literature regarding renal trauma and the subsequent complications of solitary kidneys (Cozar et al. 1990). Preexisting renal abnormality makes renal injury more likely following trauma. Any known preexisting renal pathology should be registered. Hydronephrosis due to ureteropelvic junction abnormality, renal calculi, cysts, and tumors are the most common reported entities that may complicate a minor renal injury (Sebas-tia et al. 1999). The overall percentage of these cases varies from 3.5% to 21.8% (Bahloul 1997; Giannopou-los et al. 1999). Trauma patients with horseshoe kidneys are at risk of losing all functioning renal tissue. In cases of severe trauma, recognition of horseshoe kidney anatomy, microvascular reconstruction, and renal autotransplantation allows the salvage of both the patient and renal function (Murphy et al. 1996). Physical examination is the basis for the initial assessment of each trauma patient. Hemodynamic stability is the primary criterion for the management of all renal injuries. Shock is defined as a systolic blood pressure of less than 90 mm Hg found at any time during an adult patient's evaluation. Vital signs should be recorded throughout diagnostic evaluation. Physical examination may reveal obvious penetrating trauma from a stab wound to the lower thoracic back, flanks and upper abdomen, or bullet entry or exit wounds in this area. In stab wounds, the extent of the entrance wound will not accurately reflect the depth of penetration. Blunt trauma to the back, flank, lower thorax, or upper abdomen may result in renal injury. The following findings on physical examination may indicate possible renal involvement: hematuria, flank pain, flank ecchymoses and/or abrasions, fractured ribs, abdominal distension or tenderness, and palpable mass. The clinical presentation of renal vein thrombosis depends on the balance achieved between the rapidity and degree of venous occlusion, as well as the development of collateral veins. Thus, patients may be asymptomatic, have no specific symptoms such as nausea or vomiting, or have more specific symptoms such as hematuria or flank pain (Berkovich et al. 2001).